This page provides an overview of how an ISP's network joins BTs 21st Century Network. What is the difference between WBC and WBMC? What is IP Stream Connect? What is an Aggregation Point (AP)? What is an Extension Path (EP)? How do MSILs, APs and EPs slot together? On previous pages there's an overview of BTs 21st Century Network FAQs and BT's 21CN network topology, which covers transmission of data from the home, to the exchange and over BTs core network. Now we focus on how our broadband traffic reaches the ISP's Point of Presence so that our data can be routed to and from the Internet. The traditional IPStream and DataStream products will gradually be withdrawn and replaced by a totally new wholesale products. WBC - Wholesale Broadband Connect - Where the ISP connects to the individual nodes. 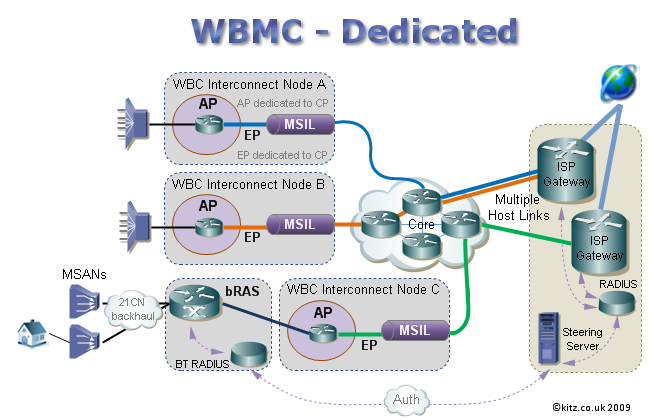 WBMC - Wholesale Broadband Managed Connect - Where BTw provides the links from each of the nodes to the ISP's PoP. Its up to the ISP to decide which product they use, they may if they wish use a combination of both. We will look at the ISP options shortly, but first we will look at the products available to the End User - which is the customer like you and me. ~ WBC/WBMC End User Product Set. Below is the list of products currently available for customers of those ISPs who provide services via the 21CN backhaul. WBC is the base product for Internet Service Providers which all other wholesale variants are based upon. It's product set is not quite the same as previous products which offered rental of VPs at the exchange (Datastream) or IPStream where the ISPs could connect using a central pipe at a central location. In the future BTw are looking to use SRA and adding Annex M.
The new product is also flexible to later add FTTP (Fibre To The Premises), and in some parts of the country this is already in trials. On 21CN, regardless of where a customer lives in the UK, your connection will go via your local exchange and through a series of routers, switches and nodes until it reaches one of the 20 Core Nodes dotted around the country. Every one of our 21CN connection is mapped to one of these core node locations. At each of (or near to) these core nodes, other carriers or service providers can connect to the network. These points of access to BTw's 21CN network are called Interconnects. WBC Interconnects will normally be located at the Metro-node level at a Core node location, although there are currently 3 exceptions to this - see 21CN nodes. What's the difference between WBC and WBMC? 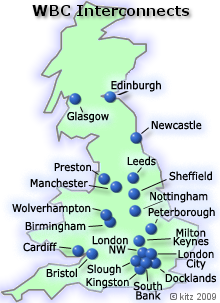 Wholesale Broadband Connect (WBC) is where the ISP can directly connect to each of the BTW core locations around the UK. The ISP can either use their own routing from these interconnects, or they may use other 3rd party suppliers to route traffic between the interconnects and their Head Office. WBC is intended as a replacement for DataStream which is when a service provider rented a Virtual Path from the DSLAM backhaul to the ISPs PoP. Often the amount of VP bandwidth rented on each DSLAM was insufficient and congestion would be common. With WBC, BTw is still responsible for backhaul routing between the exchange and the AP, and therefore should be more resilient against contention than the old Datastream product. We	shall	look at the differences between Shared WBMC and Dedicated WBMC below. Wholesale Broadband Managed Connect (WBMC) is a product aimed at small to medium sized ISPs /CPs for whom it would be economically unviable to purchase their own MSILs. WBMC is transported over the MPLS core which is owned & managed by BTw and presented to the ISP as single 10 Mbps - 1Gbps host link. 10Gbps host links are also planned for the future. With WBMC it is BT Wholesale who is responsible for managing and purchasing the AP, EP and MSIL which is then shared by multiple ISPs and charged accordingly. BTw is responsible for the WBC transportation of traffic from the customer's home, exchange backhaul and on to & over the core. Meaning that the ISP only has to purchase a single host link at any one of the core locations for all of their customers - regardless of where they are in the UK. Thus providing an affordable solution for smaller ISPs. This is similar to the older IPStream Centrals. Dedicated WBMC is aimed at medium to large sized CPs/ISPs who have a high concentration of customers at each of the core nodes. BTw figures suggest > 300k-500k at core nodes. The WBC network has 20 core nodes which the ISP may connect to. The CP/ISP is responsible for the purchase of bandwidth on the MSIL which can be 1Gb or 10Gb links. The ISP can effectively manage their network and independently purchase the required amount of bandwidth needed at each location. Traffic from the AP via the MSIL is then routed via the core to the ISP's gateway or their PoP of choice, giving the ISP the option of routing regional traffic to regional gateways or just one location. WBC is when the ISP connects via their own or third party network from each of the core locations. Dedicated WBMC uses BTw's core 21CN network to transport traffic from each of the core locations to the ISP's location(s) of choice. This still allows the ISP to have control of bandwidth traffic at the regional core locations. Shared WBMC is when BTw manage bandwidth between multiple ISPs over the whole 21CN network presenting the ISP with a single host link. ~ What is IPStream Connect (IPsC)? IPStream Connect is intended as a transition product for IPStream ISPs during the roll out nationwide of 21CN. IPStream Connect is not 21CN in that it only offers adsl1 (up to 8Mb) rather than adsl2+ (up to 24Mb). 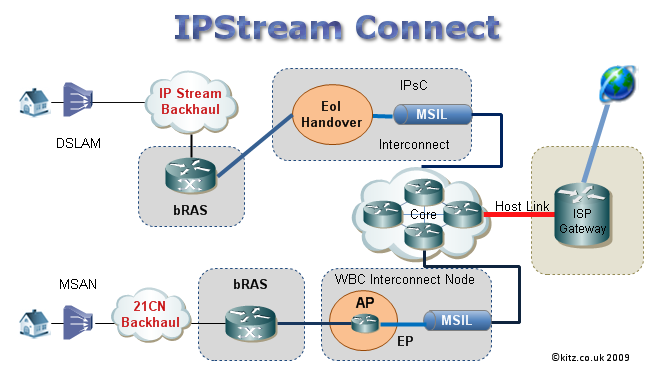 Instead it is a way for IPStream ISPs to connect customers whose exchanges have not yet been upgraded to 21CN, by allowing the ISP to take traffic at the bRAS on to either their own or a 3rd party backhaul. The users broadband connection is routed in the normal way from home <-> exchange <-> RAS over the IPStream backhaul. Once at the RAS, the interconnect will form a new Equivalence of Input (EoI) point. From here traffic can either be handed over to a third party network, or routed on to the BTw core network that is used by 21CN until it reaches the ISP gateway. The theory behind IPStream Connect is that ISPs to consolidate IPStream and 21CN customers within one platform. It is envisioned that IPStream, DataStream and IPStream Connect with gradually be withdrawn from 2014 as more exchanges are upgraded to 21CN and ISP centrals are gradually replaced by WBC/WBMC. ~ What is a MSIL (Multi Services Interconnect Link)? MSIL is the link connectivity between BT’s 21CN backhaul and the ISPs network (or the BTCore depending on which product is bought). It may also be referred to as an E-MSIL (Ethernet MSIL). MSIL is actually a product that the ISP purchases from BT Wholesale, the product being rental of access of services/bandwidth on BTs 21CN. To do this the ISP uses 10Gbit/s or 1Gbit/s fibre links to gain access to an optical port at one of BT's Ethernet Edge Aggregators (EEAs) at a core node location. The annual cost incurred to the ISP depends on how much available bandwidth they rent, how much bandwidth they allocate for use and the type of MSIL handover connection. Although each physical MSIL can carry up to 1Gbps or 10Gbps of data, BT allow the ISP to subdivide this bandwidth into a smaller Aggregation Points and Extension Paths, and only charge the ISP for the amount of EP bandwidth that the ISPs anticipates using over a period of time, and the amount of AP bandwidth actually in use. ~ What are Aggregation Points (AP)? An AP or Aggregation Point is a convergence point on a WBC Interconnect Node that combines traffic for a destination. To expand further the AP is an access port on a BEA (Broadband Edge Aggregator), which will likely be a Juniper Edge Router. Think of the Aggregation Point as being the physical access point to and from the BT backhaul where traffic merges for all customers being served from that area - kind of like a reverse ISP home gateway, its the gateway to the BTw backhaul heading back to the exchange. An ISP using WBC or Dedicated WBMC will purchase 'x' amount of bandwidth at an AP for use by their customers whose connections aggregate at that particular core node. If it helps you could think of the AP as like purchasing bandwidth for the old central, the difference being that bandwidth is only used by customers coming off that particular core node, rather than from anywhere in the UK. With WBC the AP is the point where congestion can occur if the ISP hasn't purchased enough bandwidth. BT monitors traffic going through the AP and if the ISP goes over their contracted allowance, the ISP can either elect to pay a premium for 'over use age' or only allow the contracted amount of bandwidth to pass through, which is when users will start to see the effects of contention. WBC:- Up to 5% of excess over contract is charged at normal rate. IPSC:- Up to 15% of excess over contract is charged at normal rate. In the case of shared WBMC, BTw provides the AP and the bandwidth is shared by all customers of all WBMC ISPs using that particular AP. ~ What is an Extension Path (EP)? An EP or Extension Path officially is the link between the AP and the MSIL. A WBC ISP has to purchase 'y' amount of EP bandwidth. Extension Path bandwidth could be though of as reserve bandwidth for growth, as the eventual aim is that EP bandwidth will at some point in the future be utilised. ISP's planning for future growth may for example have an EP of 500Mb, but only have a 300Mb AP. As the ISP grows then they can gradually increase the bandwidth on the Aggregation Point up to the size of the Extension Path. If it helps, you could perhaps think of the EP being like an old 622Mb central pipe where the ISP could light 155Mb sections at a time. The difference is that the amounts of the AP and EP are designated by the ISP up to the size of the MSIL they purchase. WBCs will pay BT for both contracted AP bandwidth and a lesser amount for the 'unused' EP bandwidth. ISPs will request BTw to increase the size of the AP as needed. One of the main differences between APs, EPs & centrals though is that if an ISP reaches capacity on their AP, they can go over this amount and into the EP reserve. BT charges a hefty premium though for any ISP dipping into EP bandwidth that is over their contracted AP bandwidth. In this instance the EP could be thought of as similar to a bank overdraft. 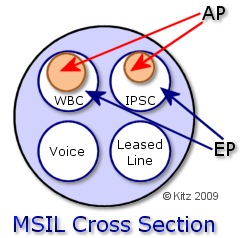 ~ MSIL, AP & EP - How they fit together. I've seen several people get confused over MSILs, APs and EPs and how they fit together, so lets try and visualise what they do. Think of it as the MSIL being the pipe that carries traffic between the 21CN platform to the SP network and in this pipe there are segments partitioned off. The MSIL may be carrying several different types of traffic destined for the same physical gateway but perhaps having different IPs. Kind of like how a network at home may have traffic destined for different PCs all heading via the same router. In this case its the ISP or CPs edge router or gateway. The EP is bandwidth which is sectioned off for various types of WBC/IPSC traffic heading to and from the BT backhaul. This bandwidth is reserved for that type of traffic but it may not all be in use. The AP is contracted bandwidth for use that is coming on and off the BT backhaul for WBC customers of that ISP. Steering is telling BTw which ISP gateway the customer should connect to. When a customer logs on to their internet connection, the BT system identifies which ISP the customer belongs to and looks up the IP address of the gateway that they should connect via from the ISP maintained steering server. Steering is used on both WBC and WBMC, but works slightly differently on each system. WBC customers connections are hardwired to the ISP node location and are unable to connect to any other node location. WBMC customers can be directed to any location where an ISP has a WBMC gateway. WBC customer node locations are identified from exchange related data such as the line card & port details and their BBEU number. WBMC customers are identified similar to the above and additionally their login username. (SSB @isp). WBC - If an ISP has 2 or more WBC gateways at a particular node location, then the ISP can dictate which gateway at that particular node location the customer will connect to. They cannot change node location. 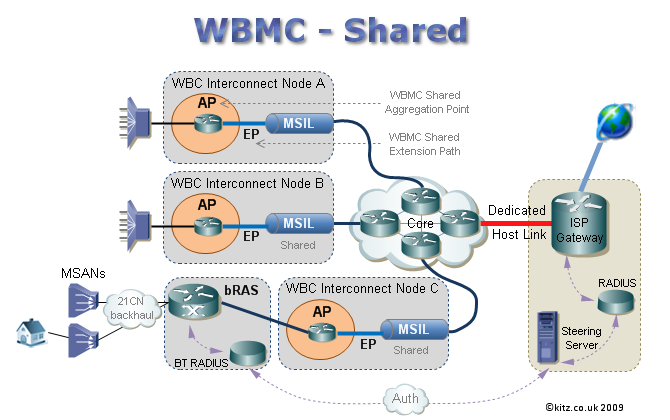 WBMC - The ISP can dictate which of their WBMC gateways the customer is to be connected via. ISPs maintain the records of customers details such as the BBEU -v- connecting location gateway IPs on their steering servers.